The blonde revolution continues as edgy, ash-blonde shades gain popularity! But that’s not the only new shade of blonde finding favor with young and mature trendies! 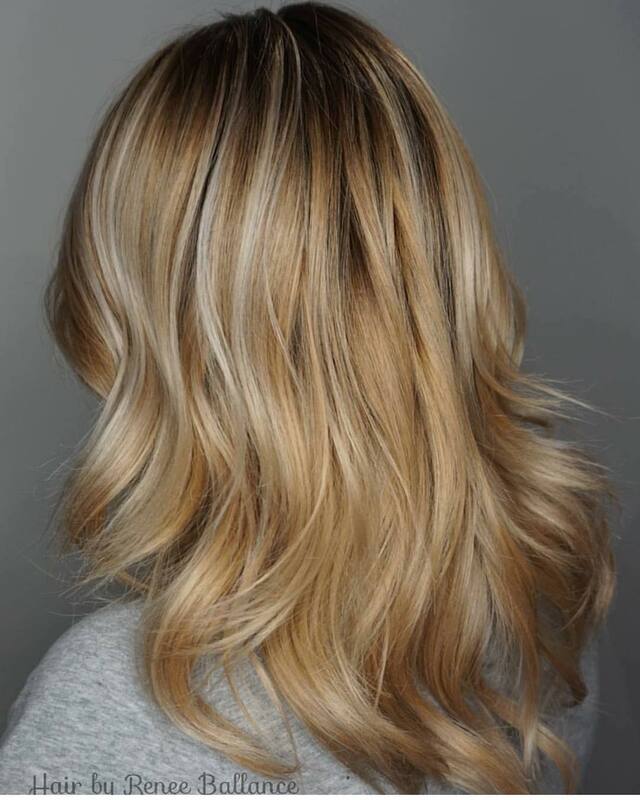 Natural shades of beige-blonde are incredibly chic, and with lighter roots the overall effect is softly flattering. 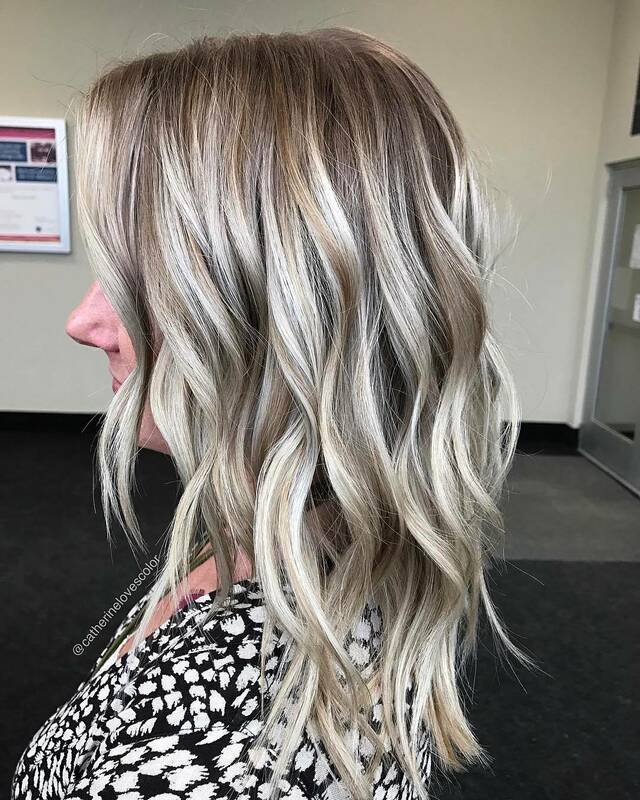 Pale gold- and copper-blondes are fashionable for complexions with a warm undertone and silvery gray can look absolutely stunning with cool undertones. Add to that lots of different ways to create special effects with streaks, balayage and ombré, and you’ll be as excited about the latest looks as we are! This is the happy look of a very satisfied client! And who wouldn’t be thrilled to get these long, rippling waves shot through with honey-, amber- and beige-blonde? Lighter blonde tresses frame the face focusing attention on your eyes and lips, and the sharply textured tips in white blonde add even more style! This is also a great way to make your hair look thicker. 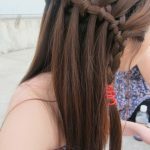 Here’s a gorgeous, natural hairstyle for long, straight hair and a stylish way to ‘go blonde’ without the need to worry about darker roots showing through. 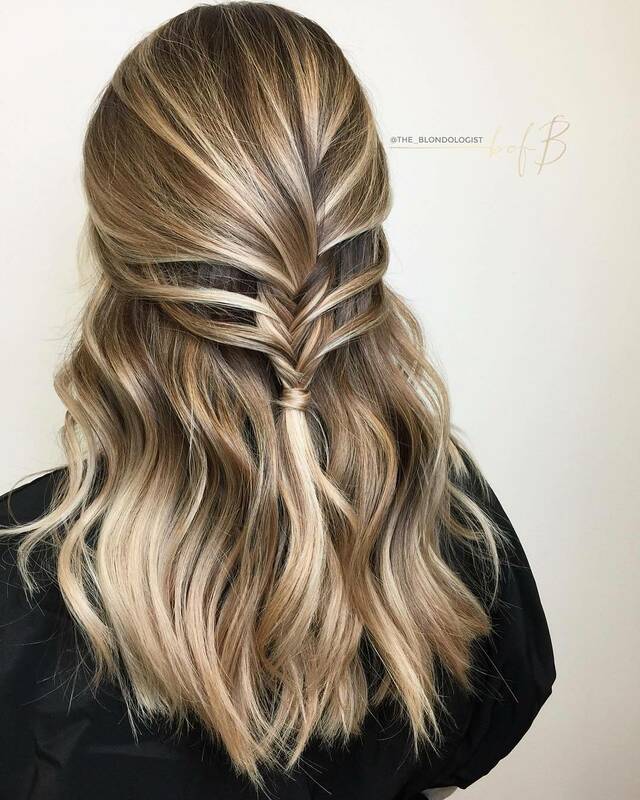 With a clever mix of dual-blonde highlighting in streaks and ombré, you get a sophisticated look that’s perfect for adding patterns in half-up and braid hairstyles! Softly gleaming beige shades make a chic alternative to ash- or copper-blonde. 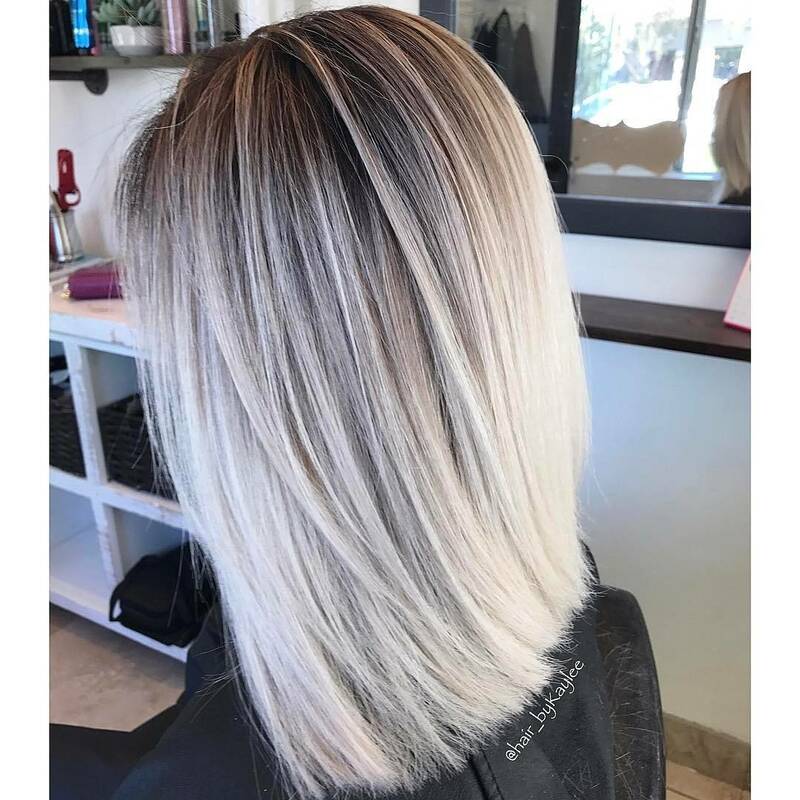 As fine hair is usually silky-textured, it makes sense to emphasize this natural feature with a mid-length bob and a stunning color! 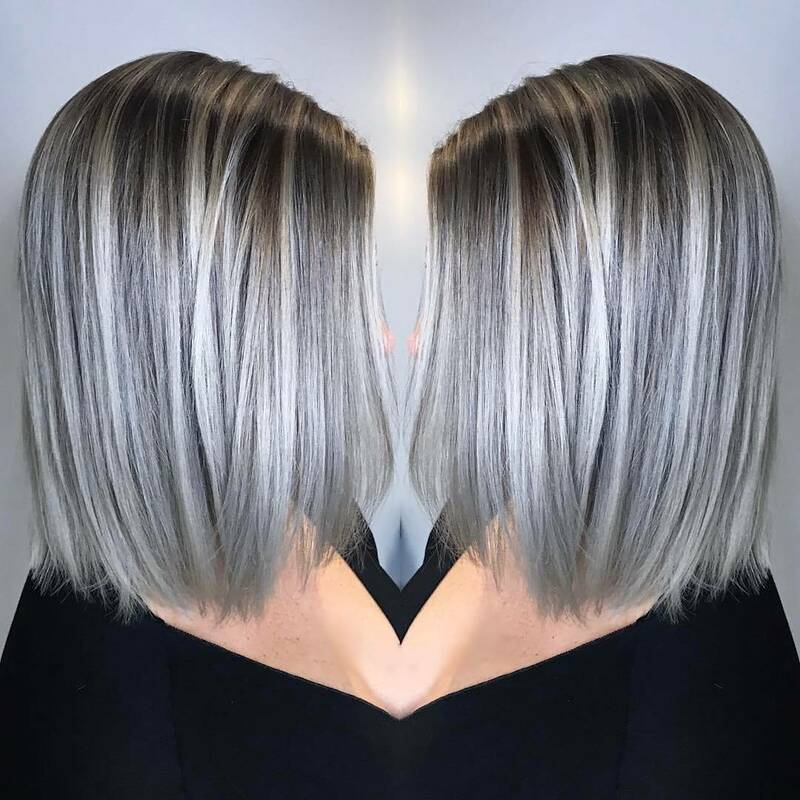 This super-trendy blend of silver and dove-gray over brown roots adds texture that makes thin hair appear thicker. And this simple cut with shorter layers around the chin is very easy to style. If you’re sick of trying to cover your gray hair, take advantage of this idea and relax! This is a knock-out color combo that’s perfect for a special occasion! It works best on naturally fair hair, as the blonde shades include very light ash- and white-blonde streaks. As this model has quite a red tone to her skin, the roots include some warmer amber and soft beige colors. 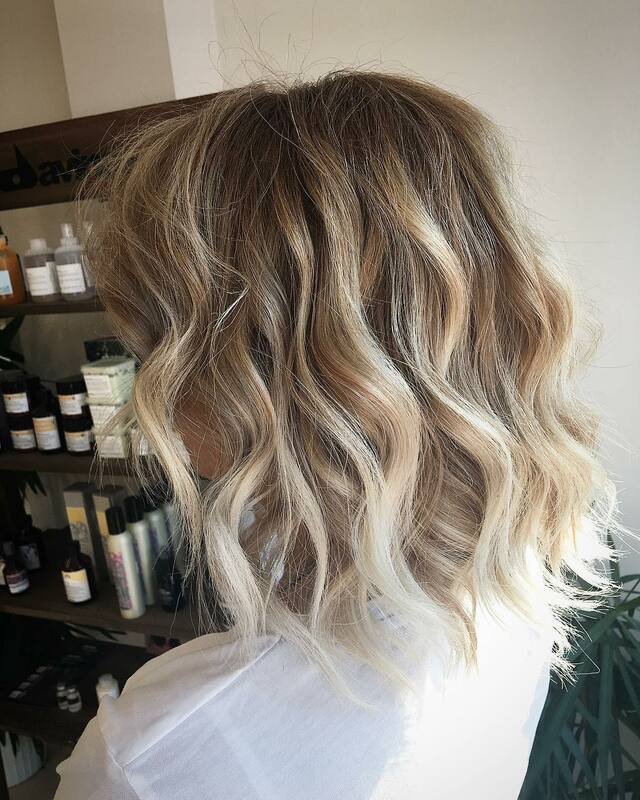 Normally, ash-blondes have a pale skin-tone with a cool undertone, but a clever colorist can play with colors to ensure they complement your natural coloring! If the latest ash colors aren’t your style, how about the new beige-blonde colors? Beige blonde is a lovely shade that’s soft and feminine, especially on long hair. The roots of this gorgeous hairstyle are light-brown with golden tones, adding a little warmth. And long, deep waves show-off a beautiful blend of beige blondes highlighted with touches of white and finished off with ash balayage! This easy-care straight long bob is an excellent choice for fine or medium-textured hair types. Bleaching makes each hair-shaft expand, so your hair will become thicker straightaway. But you’ll need to use lots of conditioner (or warm olive-oil) to keep it soft, shiny and flexible. White-blonde should have a ‘tone’ added to ensure it matches your complexion – in this case the toner is pink. This type of deep, defined wave is just what you need to make hair appear more dense. Beneath the waves, you can see sections of slightly darker beige hair curled in plump, barrel ringlets that add volume. 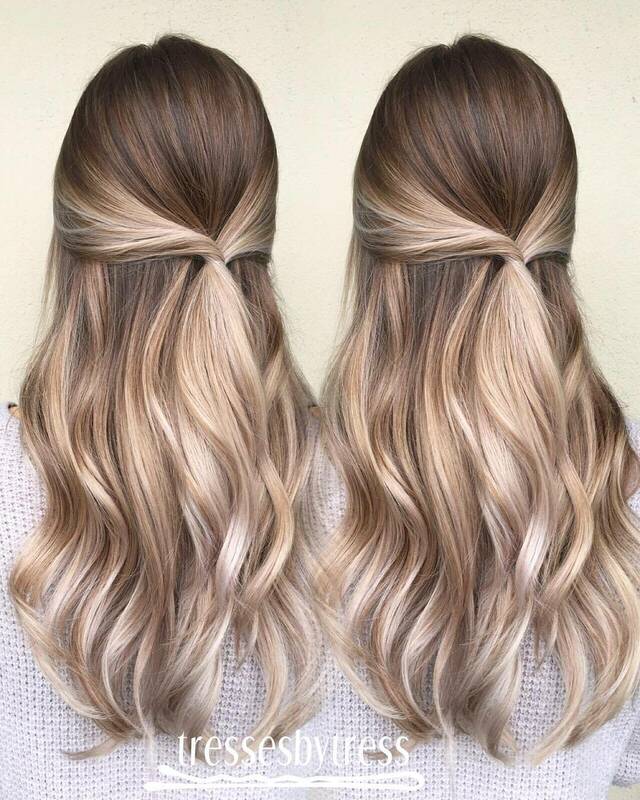 Color-wise, the top is an attractive, natural beige shade with hints of pale gold, which gradually becomes white-blonde in a fabulous 3-D effect. Love this lively look! This golden-blonde look is not too bright or yellowy, but a neutral beige-golden blonde that is more natural and fashionable this year. 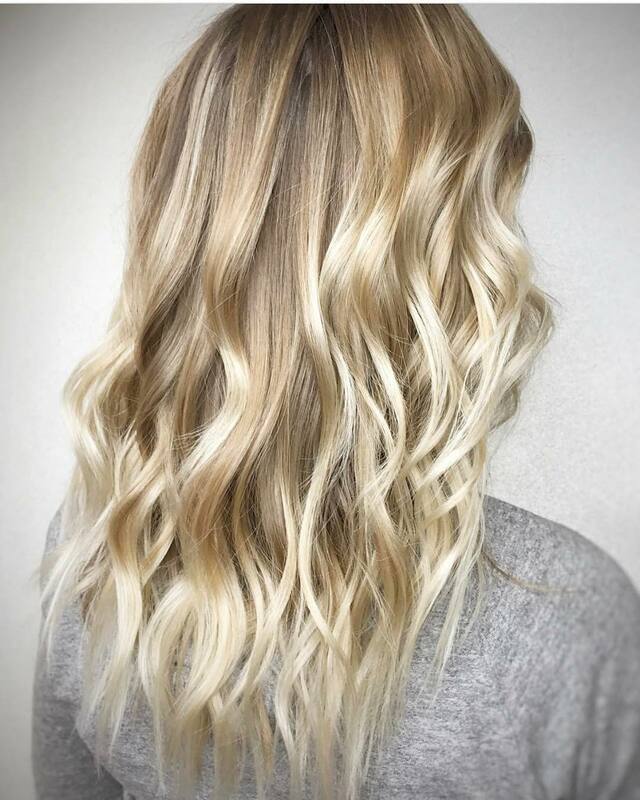 Pale-gold highlighting and ombré accentuate the waves and textured tips in a gleaming, pearly tone that adds even more richness to this luxury look! The hair has a casual, tousled finish that matches the soft colors in a lovely, modern look for long hair. Here’s another classy color idea – this time we have soft, pale copper with neutral blonde balayage. The tone is beige and that’s the key to ‘toning down’ brighter colors to achieve this season’s signature ‘neutral’ vibe. 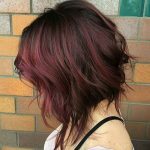 Colors are more restrained, with roots that are only a couple of shades darker, creating a beautifully harmonized blend of amber, soft ash and pearl! 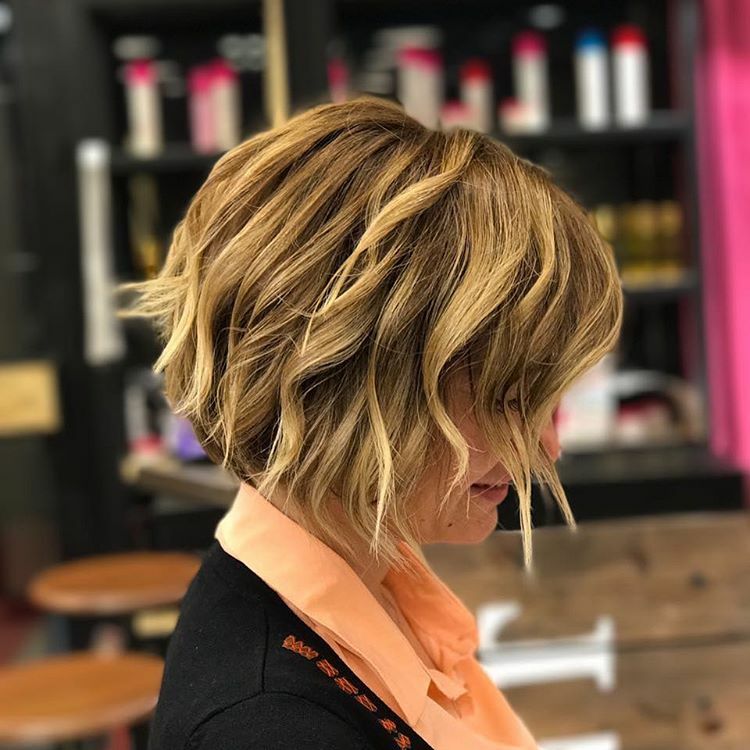 Balayage short haircut for women over 50: My final choice of blonde balayage is a style and color that’s very flattering to mature skin-tones. The chin-length, angled bob suits most face shapes and all age-groups and can be styled in many different ways. This image shows a trendy look with disconnected side layers, edgy twist-waves and sharp tips. 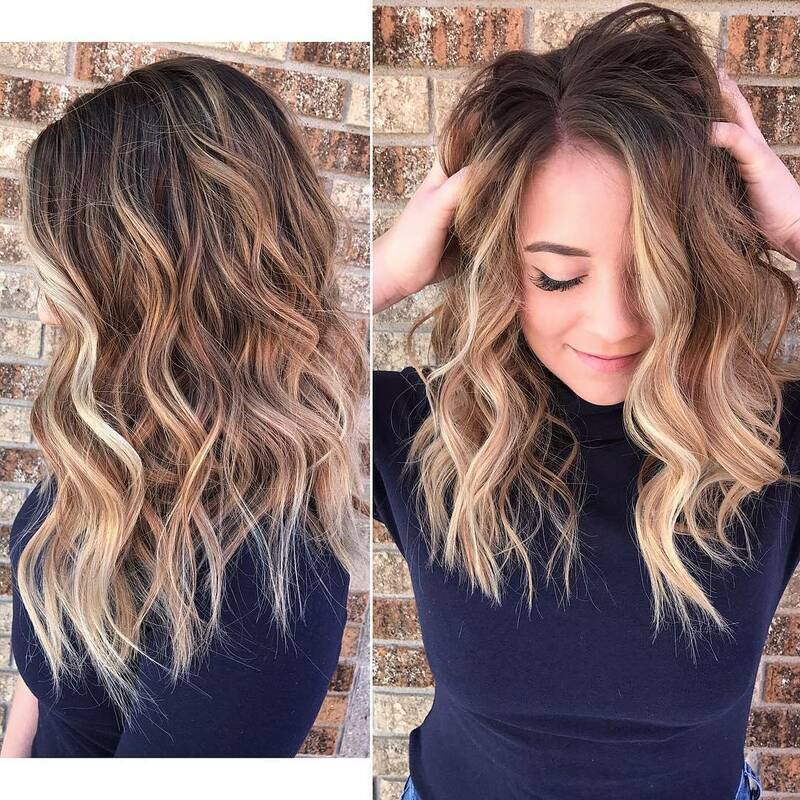 The roots are light gold-brown, which harmonizes well with the flattering golden-blonde balayage. 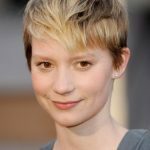 next post 10 Stylish Pixie Haircuts – Short Hairstyle Ideas for Women Ready for a New Cut & Color!